Why is He called LIGHT? You know what Jesus was saying when He said I’m the light of the world? He was saying, in effect, I am Israel’s…what?…Messiah. They would have known that. The rabbis even said the name of Messiah is light, you can read that right in the rabbinic writings. They knew that God was going to send a light to the nations. Notice He was the light to the nations, not just to Israel. He says, in effect, I am that light. Malachi 4:2 put it this way, Malachi 4:2 says, “The sun of righteousness…and how do they spell sun? S‑u‑n…shall arise with healing in His beams.” Some translate it wings, beams the same thing. They knew that the Messiah would be called light. They knew that God was the essence of light and the Messiah from God would also be light. And so when Jesus said I am the light, He is claiming to be Messiah. And John the author of the book made the same claim in the first chapter. In verse 5 he says, “And the light shines in darkness and the darkness overcame it not.” Verse 9, “That was the true light,” see. Christ came as that light that Messianic prophecy said God would send. To the darkness of falsehood He is the light of truth. To the darkness of ignorance He is the light of wisdom. To the darkness of impurity He is the light of holiness. To the darkness of sorrow He is the light of joy. To the darkness of death He’s the light of life. He is called light because the world is dark and the antithesis of darkness is what? Is light. He is everything the world isn’t. And Jesus is saying nothing more and nothing less at this point than I am your Messiah. But I can take it one step further than that. He was not only claiming to be Messiah, He was claiming to be God. You say, “How do you know?” The psalmist said this, “The Lord is my…what?…light.” And when Jesus said I am the light He was saying I’m God. That’s quite a claim. And isn’t that what John said in 1 John 1:5, “This then is the message which we have heard of Him and declare unto you that God is…what?…light and in Him is no darkness at all.” And when Jesus came along and said “I am light,” He was claiming, number one, to be Messiah, number two, to be God. 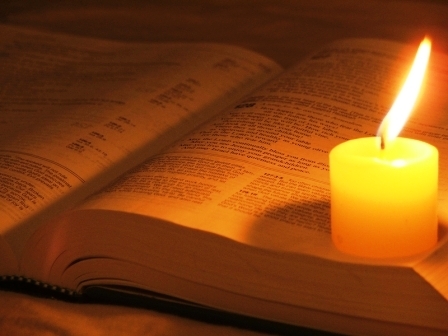 Posted in Devotionals/Commentaries, John, NovemberTagged Bible, Bible daily, Bible reading, Bible study, daily Bible, I am the Light of the World, John, John MacArthur, Light of the world, Scripture, Why is He called LIGHT?